by 'Yinka Vidal - Foreign correspondent in US. Democratization of Nigeria is just the beginning of a governing process. The primary factor is not to create a government with a cosmetic look of democracy, but to create and maintain a platform where Nigeria's problems can be addressed. The adoption of democracy based on the Western type of government may not help us since our problems are not the same. This is however a start in the right direction. Nigeria's democracy must implement an operational government free of fanaticism, tribalism, racism, prejudice or any form of bigotry. We must learn to embrace our differences and not use these differences as excuses for tribalism, ethnic divisiveness or hatred. In some form of Western democracy, some of these evils are insidiously built into the system where a particular group of people has to fight for their rights while others were believed endowed by their Creator to these rights. Nigeria should not denigrate to this level of bigotry. We must create a nation where everybody's right is preserved under the law whether black or white, an easterner, northerner, southerner or westerner - - the tribe and ethnic group should make no difference. Nigeria as a nation must plunge into the processes of modernization and industrialization. To do this, we must recover the stolen monies from past politicians and corrupt government officials. Nigeria needs an excellent mass transit system with workable telephones and effective mass communication system. We can embrace the power of the internet to open Nigeria to the world and share information with Nigerian intellectuals from abroad. Whatever we do with this new democracy, Nigeria must take care of his people. We can not allow anybody to do this for us. Like the words of our old national anthem, "Though tribe and tongue may differ, in brotherhood we stand. May God help us to build a nation where no man is oppressed." We must never mine the natural resources of an area in Nigeria without giving something in return to the locale. Sarowiwa should never have died and the government must develop and modernize oil drilling areas of Nigeria. If the government must drill the oil in a particular area, the same government must give something in return to these people instead of the people living in abject poverty. 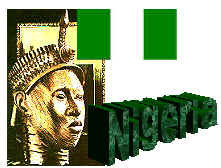 No matter what we do to ourselves, no matter what they say about us, Nigeria shall rise again!